The traditional method of getting a direct mailer into the hands of your consumers requires a series of steps, several hand offs, and a significant amount of time between the initial need or request and the final delivery. All that can change when direct mail is executed through the S4 Marketing Resource Center (S4 MRC). Hand offs are greatly reduced, streamlining the approval processes and cutting the total processing time in half. 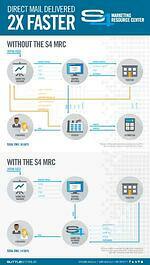 This detailed infographic shows a comparison between a traditional direct mail workflow and one with the S4 MRC. See for yourself how much time and frustration you can save, and if the S4 MRC may be a good fit for your distributed marketing network.